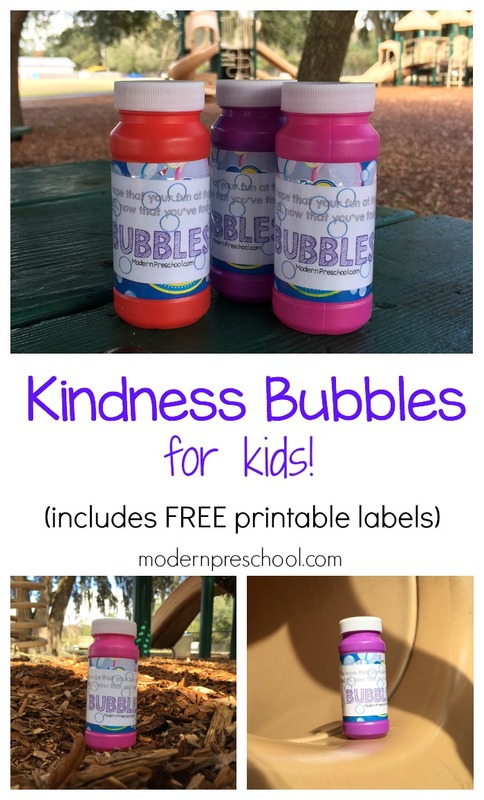 Surprise Kindness Bubbles for Kids! 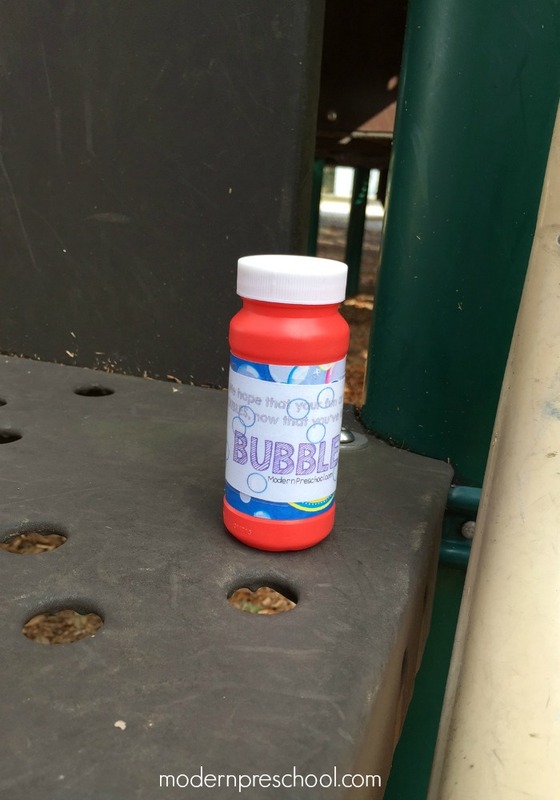 When my oldest was a preschooler, we would bring bubbles when we would meet friends at the park. They were always a hit with all the kids! The kids loved sliding through bubbles, swinging into the bubbles, and blowing bubbles from way up high to watch them float through the air. The great thing about bubbles is that everyone around gets to enjoy them, not just the bubble blower! 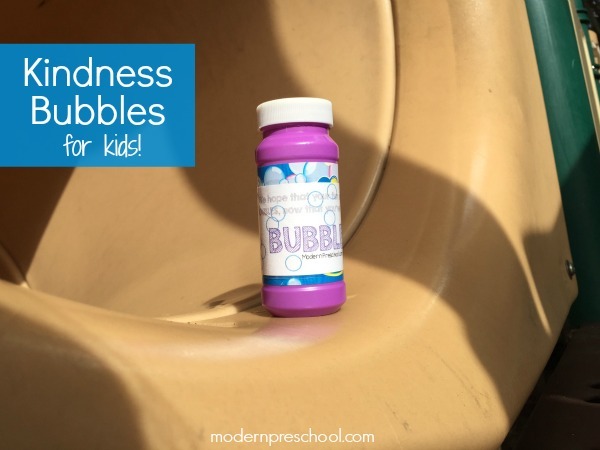 Hidden bubbles at the park are the perfect surprise act of kindness for kids! Affiliate links included in this post. 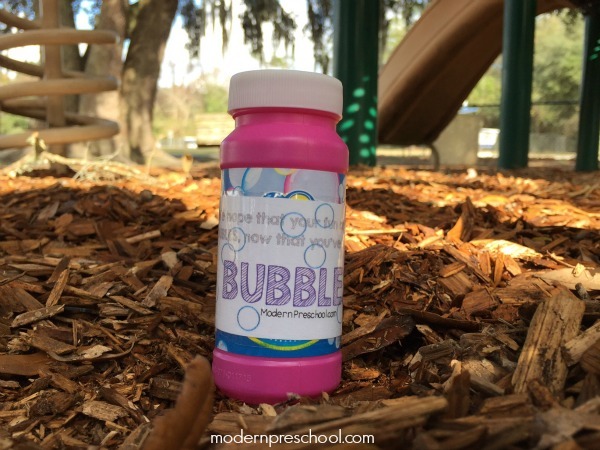 My preschoolers, my kids at home, and even my dogs love bubbles! They are inexpensive and require no prep on your end to play…ok, except fishing that wand out of the slimy bubble solution! Download the free Bubbles for Kids printable labels to attach to the bubble bottles below.Print the bubble labels and cut them apart. Attach the labels to the bottle of bubbles. We used clear packaging tape in case it rained before the bubbles were found! At the dollar store you can usually buy a 3 pack of bubbles (or order a bunch here) and they are a great size for little hands. We decided to hide our bubbles at one of our favorite parks! A must-do at this park is the tunnel slide, so the first bubbles were placed there right away.After hiding all the bubbles, we ran back to the car as fast as we could because another car pulled up and kids were heading towards the playground. We didn’t want anyone to know the bubbles were from us! This secret act of kindness is part of the 100 Acts of Kindness Challenge hosted by Megan at Coffee Cups and Crayons and Kristina at Toddler Approved! This challenge occurs between January 18th and February 14th. Follow along, join in, and see what acts of kindness are being shared! You can follow #100actsofkindness on Instagram too! This won’t be the last time we hide bubbles at the park. We already have our next set of bubbles labeled and in the car just in case we are near another park!